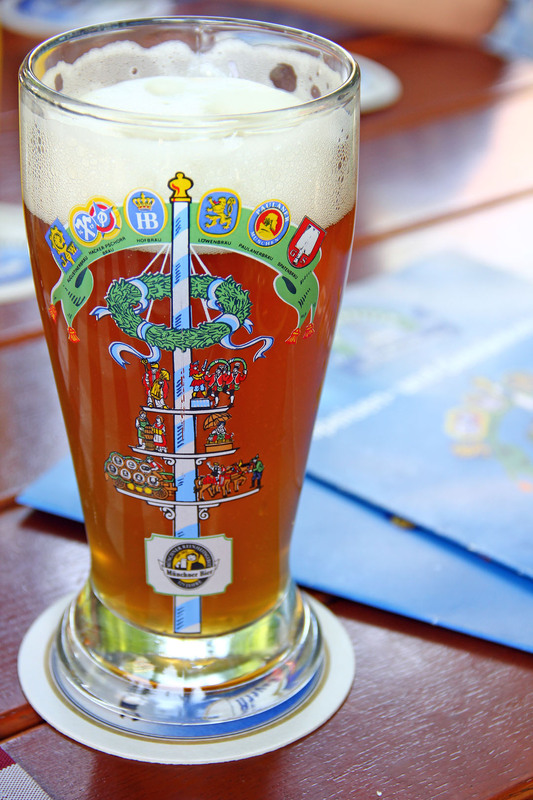 A visit to a beer garden when you are in Munich is a must that is why we visited two when we were there one was the Königlicher Hirschgarten and the Biergarten Viktualienmarkt. Both of these places are amazing and have their own charms, Königlicher Hirschgarten being the largest in the world which seats 8000 people easily and the Biergarten Viktualienmarkt which is located right in the centre of a really huge food market in Munich. During our first night after checking in at our hotel and had dinner we immediately drove to Königlicher Hirschgarten to have some beer, this beer garden is located in the middle of the park and not easily accessible by car especially when you don’t know where you are going. Most of the entrances are accessible via bike or foot so driving a car you need to know where you are going which we managed by using the traditional means, asking people. The entrance to the park via car is hidden inside a complex maze of inner streets and since people usually go by foot or bike it was easy to find some parking space. As we enter the place you can already notice how massive the place is, especially when you come from a place like New Zealand. There were lots of seats and even it was a weekday there were lots of people. We ordered, seated and enjoyed a big glass of Weissbier which was really good and refreshing, that’s what we are after so no fancy meals today only a good beer. Next day came and we were scheduled to go to Viktualienmarkt to have our lunch there, little did I know that we will also be dining in a beer garden. As we stroll along the place we were so amazed with such a variety of food items on sale, from sausages, fresh fruits and vegetable as well as cheese and olives. We tried some fresh fruits, cured meats and meatloaf as we walk through the market and right on the middle of it all was this beer garden and lots of people are dined in. As we passed by I saw this Schweinshaxe picture on the over board menu and that’s what made me stop and dine in there. There we lots of people so we shared tables with other diners, not really that hungry yet so it took as quite some time in deciding what to order eventually it ended up with food items we wanted to try. First was the Wiesswurst which looks like bland in taste but trust me it packs a lot of flavour. This sausage basically is made out of minced veal and bacon served with hot water in a bowl. 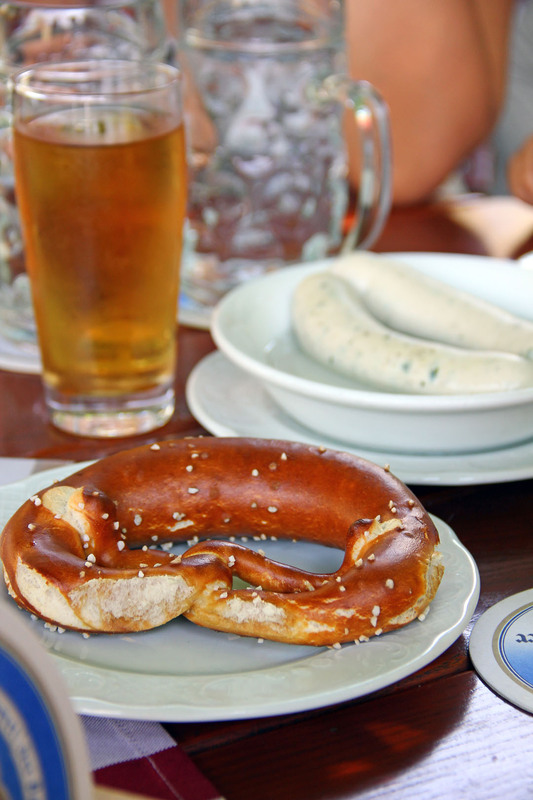 This is served with a large Pretzel making it a full Bavarian meal. 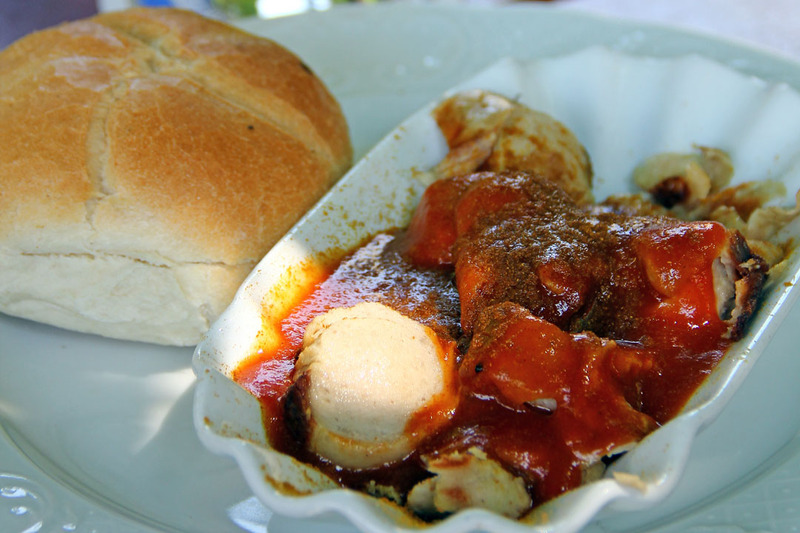 Next was this Curry wurst, a very popular street food in the Bavarian Region as well as its surrounding places, basically it is grilled sausages served in a sauce made out of ketchup, Worcestershire sauce and curry powder. It sounds like an odd mixture of ingredients but again it tasted great, never had thought it would taste like such. 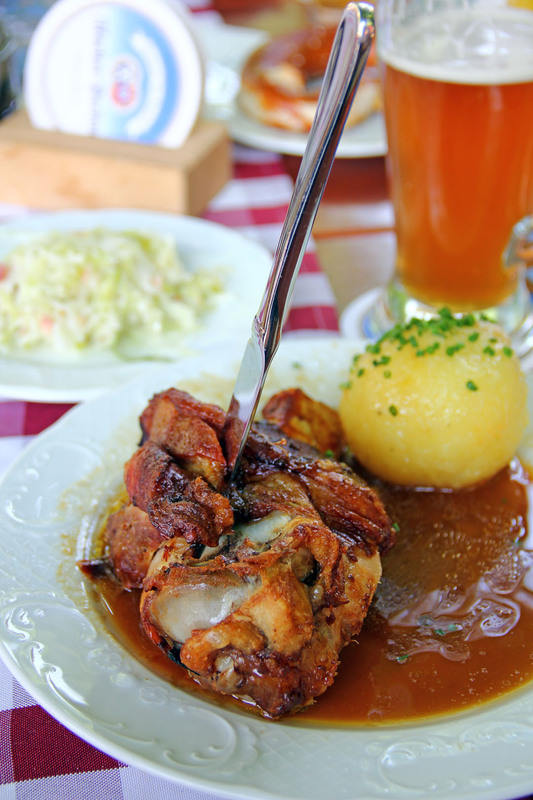 Then the reason why we dined in here, the Schweinshaxe. For Filipinos this would look like a “Crispy Pata” because it is nearly like one, instead of deep frying it like the Filipino counterpart this is baked to crispy perfection. Also while the Filipino version uses either lechon sauce or garlic infused vinegar as a dip, schweinshaxe is served with a rich brown gravy. We also usually serve this for a family but in Germany its one per member. So what’s the verdict? While it’s not as crispy as the “Crispy Pata” due to the cooking method it was good, in fact the gravy matched well with the meat, I loved how tender the insides are, the meat when sliced it falls easily from the bone. Definitely everything should end up with a big glass of Weissbier so we ordered one, luckily we did not ordered a couple as it not as cold as what we are expecting, especially at summer a cold beer is a must. Other than that overall experience was great, food was good and I loved the place. Every time we are in Munich, we walk through the Viktualienmarkt with its big May pole. The foods on display are wonderful. Did you go to the two story indoor market that is next door…it is great too.